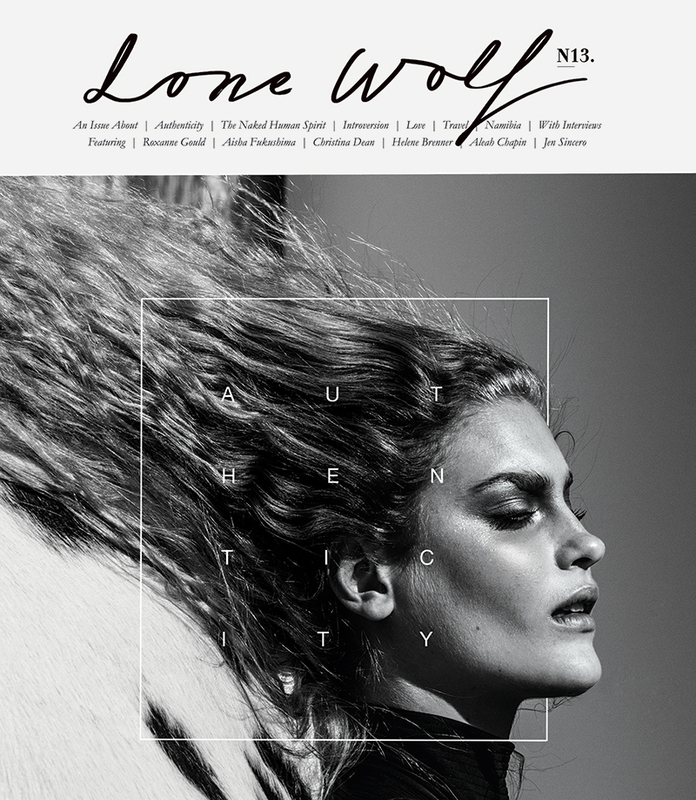 Lone Wolf Magazine is an internationally distributed print publication run and operated by Natalia Borecka. Lone Wolf is the only fashion magazine on the market that explores the human condition through art and philosophy. It is so much more than a fashion magazine, but an art piece that takes you through a transformative aesthetic journey. Every step we’ve made so far in our evolution as a magazine has been fueled by the belief that to affect positive change in this world, we need to change what we idolize. Lone Wolf magazine exists because we believe fashion is not just about clothes – it is a language that speaks to what we value as a culture. The fashion magazines you pick up on the news-stands will tell you where we stand both as women and as human beings. In magazine after magazine, we see beautiful but passive models staring back at us, urging us to wear a certain shade of lipstick, or buy a certain cut of dress. Seems innocent enough, and yet, studies show that we are bound to walk away from reading a fashion magazine feeling worse about ourselves. As women we all want to feel beautiful and wear beautiful clothes, but that is not all we want. We want to be admired and accepted, we want to feel strong, intelligent, and respected. We need to feel like we’re nourishing our minds as much as our creativity. In a sense, I guess you could say for us fashion is the vehicle, not the destination. It is a language that tells us so much more than what we should wear; it can be a medium through which we glamorize what’s most important in our lives. And so, instead of diet fads, celebrity babies, and fashion trends that die out too quickly, we wanted to show you editorials dedicated to teaching young women how to become astronauts, or discover a new galaxy. We can tell you what was really behind Picasso’s blue period, and the real reason boys wear blue and girls wear pink. We can teach you how to read body language, and overcome depression. Lone Wolf has done all this and more through the language of fashion alone. The idea is, if you can add depth and meaning to something beautiful, you have an obligation to do so. In this way we hope to inspire you in ways that you never imagined a fashion magazine could! From our beautiful fashion spreads, to insightful articles about philosophy, art and fashion history, in these pages you will find an opportunity to grow, learn and discover new ideas. So what are you waiting for, get your print copy of Lone Wolf today! To send us your photography submissions, article pitches and resumes please contact: [email protected] | For advertising, distribution and retail questions please contact Natalia Borecka: [email protected] | If at any point you hear from Lone Wolf Magazine and the email is not coming from an @lonewolfmag.com domain, then it’s not from us. WRITERS: Anna Cipollone, Abigail Tarttelin, Aireanne Hjelle, Angie Iver, Ashlee Girdner, Aria Darcella, Caroline Leung, Chad Burton, Christina Dasilva Dorthia Stephenson, Eric Boshart, Erin Scholtz, Hailey Merkt, Justine R. Kelly, Kelsey Anderson, Laura Yan, Lindsey Coulter, Marie Baun, Michelle Rostmian, Natalia Borecka, Rachel Wood. PHOTOGRAPHERS: Alexandre Paskanoi, Alex Evans, Anna Wolf, Anouk Lessard, Anya Holdstock, Andrea Olivo, Andrei Akimov, Ansgar Sollmann, Arved Colvin Smith, Barbara Vidal Jimenez, Bibi & Jacob, Brent Chua, Caitlin Bellah, Cara O’Dowd, Christine Kreiselmaier, Cochi Esse, Coliena Rentmeester, Dicky Manana, Elizaveta Porodina, Erica Fava, Erika Hokanson, Filippos Hatzis, Fiona Quinn, Francesco Ormando, Gustavo Lopez Manas, Harper Smith, Jane and Jane, Jeanne Menjoulet, Jette Stolte, Katriena Emmanuel, Kristina Walther Lewis, Laura Makabresku, Lindsey Drennan, Lonnie Webb, Mario Caponi, Mark Rubenstein, Michele Yong, Monica Jelinska, Muriel Leibmann, Natalia Horinkova, Oliver Fritze, Patrick Lascina, Philip Bouchard, Robert Gaudette, Sonja Kranz, Susan van Treel, Stefan Giftthaler, Suzanne Rensink, Taghi Naderzad, Tristan Casey, Tyson Ernste, Wendy Bevan, Xuan Hua. ARTISTS: Angie Iver, Aaron Rinas, Carson Ellis, David Fullarton, Eleanor Davis, Joel Moore aka Mulga, Jordan Wester, Kate Thornley, Kira Shaimanova, Amanda Lee Shirreffs, Laura Fedynyszn, Manjit Thapp, Roxanne Coble , Tran Nguyen, Yelena Bryksenkova, Zaria Forman. FASHION EDITORS: Aartthie Mahakuperan, Adele Cany, Alexis Honce, Amanda Lee Shirreffs, Anja Niedermeier, Bobbi Paidel, Chad Burton, Chiara Aversano, Chloe Mak, Christine Baker, Christina Dasilva, Dara Schafer, Edith Dohmen, Elnura Badalova, Francesco Pinna, Holly Valanne Roberts, Isabelle Long, Jennifer Burland, Jonothan Liang, Josepha Rodriguez, Karen Van Binsbergen, Kiri Donaldson, Kazik Stolarczyk, Leanne Ford, Long Nyguen, Luca Termine, Maela Leporati, Madley, Maela Leporati, Melanie Norian, Meryl H., Mira Uszkureit, Miu Koridi, Natalie Bradshaw, Nadia Pizzimenti, Nicole Schneider, Olivien Lejeune, Paula Oritz, Pip Edwards, Rebecca Vitartas, Sara Soares, Sarah Gentillon, Susanne Marx, Suze Kuit, Thea Lewis Yates. HAIR/MAKEUP: Adrienne Herbert, Brittany Sinclair, Carolin Jarchow, Chritelle McIntosh, Daisy Calleja, Daniela Magginetti, Danielle Kil, Dat Tran, Delia Lupan, Diana Mejia, Elen Kergoat, Emma Osbourne, Grzegorz Szustak, Julie Coulombe, Julie Cusson, Justin Henry, Marco Minunno, Mari Matsumoto, Matthew Genser, Max Lam, Michael Salmen, Natalie Ventola, Phoebe Dawson, Sara Casiraghi, Shawnna Downing, Siobhon Luckie, Simon Izzard, Spiri, Stephanie Jacquet, Valerie Fischer.